Butter Chicken or Chicken Makhani is a popular recipe at Indian restaurants made by marinating and grilling boneless chicken pieces, after which they are cooked in a rich tomato and cream based gravy. 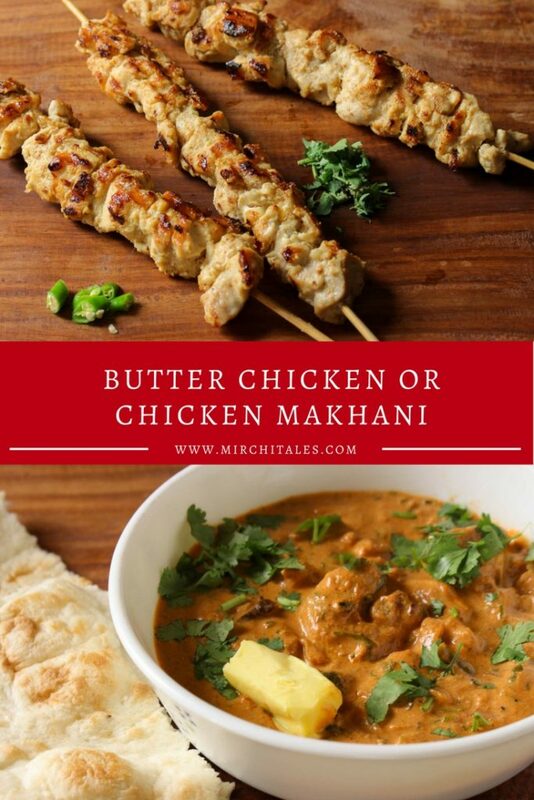 Butter Chicken, Chicken Makhani or Murgh Makhani is an entree I love to order at restaurants. The dish consists of boneless chicken cubes marinated in yoghurt and spices that are grilled in butter resulting in golden brown chicken with the most appealing char marks on it. The grilled chicken pieces are then simmered in a fragrant tomato and cream gravy to make a decadent dish, best served with garma garam garlic naan, paratha or zeeray walay chawal. This two-step process of grilling the chicken separately and then making the gravy can be time consuming, but the results are worth it. 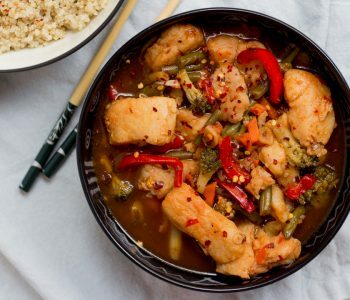 If you are looking for a quick one pot version of the same dish, check out my recipe here. 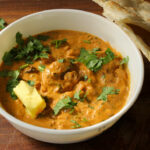 And if you are looking for a vegetarian makhani recipe, do check out my recipe for mushroom butter masala. The recipe that I have shared has been adapted from Maunika Gowardhan, an Indian food writer and chef who I strongly admire for her food knowledge and recipes. I also have her book “Indian Kitchen”, and it is one of my go-to cookbooks for authentic Indian food. Place the ginger paste, garlic paste, green chilies in a bowl. Add yoghurt, besan/chickpea flour, red chili powder, garam masala, coriander powder, lemon juice and salt. Whisk together or mix with a fork to ensure there are no lumps. The marinade will be thick. Add the boneless chicken pieces and stir to combine properly. Make sure that all the chicken is coated properly. Let the chicken marinate for at least 2 hours, preferably overnight. Soak wooden skewers in water for about 15 – 20 minutes. This is to ensure that they don’t burn when grilling. 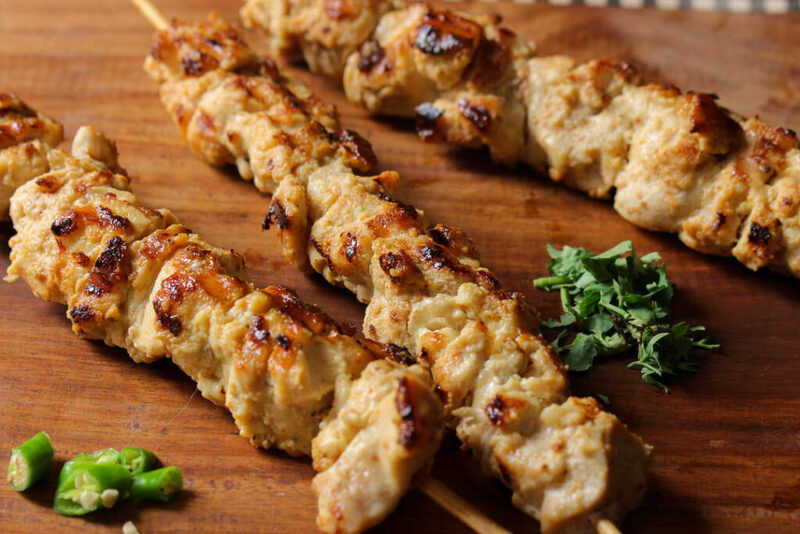 Skewer the marinated chicken pieces on the skewers, shaking off the excess marinade. Heat a grill pan or frying pan on medium, and melt about a tablespoon of butter. The grill pan will result in grilled marks which look beautiful visually but the frying pan can also be used. The chicken can also be baked off in the oven. Cook for about 20 minutes till the chicken pieces are cooked through. Cook them on medium-high heat for the first few minutes to result in a golden brown exterior with slightly charred edges. After that, turn heat to low so that the chicken can cook through from inside. 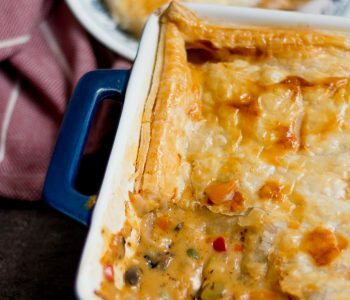 If worried about the chicken cooking through, cover with a dish lid, which will create steam ensuring that the chicken is cooked from all sides. Add butter as required for basting and cooking the rest of the batches. Once the chicken is ready, take it off the skewers and set it aside. The chicken can also be eaten on its own with roti or rice, and even made into paratha rolls with chutney and onions. Heat a medium saucepan and add butter. Once the butter melts, add cardamom, cinnamon and cloves. Saute for about 30 seconds, and then add chopped onions. Saute the onions for about 5 – 8 minutes till they turn light golden. Add ginger paste and chopped green chiles. Cook for a minute, and then add salt and chilli powder. Stir and then add the tomato puree, cooking for about 5 – 10 minutes. Add the cream, and cook for about 2 minutes, making sure to stir to mix all the ingredients properly. Add the cooked chicken pieces, along with the honey and fenugreek leaves. Simmer on low heat for about 10 minutes till the chicken is warmed through. Add water if the gravy feels too thick. Turn off heat, and add garam masala powder, along with fresh coriander and butter for garnish. 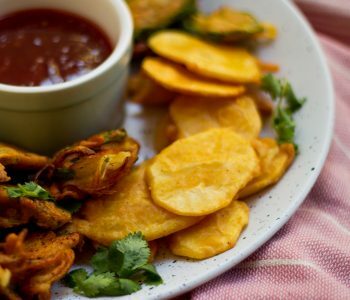 Serve hot with roti, paratha or rice.